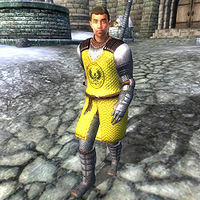 Gerich Senarel is an Imperial Guard and a Lieutenant in the Bruma City Guard. Gerich has a relatively simple schedule. Usually he spends quite a lot time patrolling. He sleeps in Castle Bruma Barracks from 10pm to 6am and then for the whole day ('till 7pm) he mostly patrols the city (the path is chosen randomly, each lasts roughly two hours). Sometimes he wanders in Castle Barracks. At 7pm he starts a three-hour-supper, and then goes to bed. He prefers light armor: wearing chainmail boots, gauntlets, greaves and a cuirass with Bruma's coat of arms. In combat he relies on a silver battle axe. When he is not in uniform he dons a brown shirt, tan linens and a pair of quilted shoes. He also possesses a set of lower class clothing; a pair of huntsmans leather pants, a belted vest and a pair of sack cloth sandals. He also carries some gold and two keys, the castle's interior key and the castle key. He is not too impressed with the many Nords living the wild life in the cold city of Bruma. When asked about town he will misquote Captain Burd and reveal his personal opinion on the locals: "As Captain Burd says, we have to stay on the good side of the local Nords. It ain't their fault they're ignorant barbarians." Should Burd fall during the battle for Bruma, Gerich is left as captain of the Bruma guard. Gerich was supposed to greet people by saying "Lieutenant Gerich Senarel of the Bruma Guard." but as he is a guard, all the standard guard greetings take precedence and it is never used (listen). This page was last modified on 23 August 2018, at 00:16.